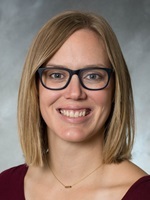 As the faculty assistant for the business and economics department, Ashley Stanislav helps professors provide high-impact experiential educational practices for current and future Northwestern students. She also documents the department's work for accreditation and assessment reports and builds and maintains relationships with business partners. A Northwestern graduate, she taught U.S. history and government to high school students for two years. Prior to joining the business department, she served as an event planner and campus visit assistant for the college's admissions office.